A fitness tracker is a nice, handy gadget that will allow you to stay on top of your fitness goals. However, we can all agree that they can be quite expensive, especially the trackers from prominent brands. Fortunately, you’re not limited to well-known brands as there are many lesser known ones out there that offer trackers won’t break the break. Yes, it’s possible to find the best cheap fitness tracker with just a little research on your part. 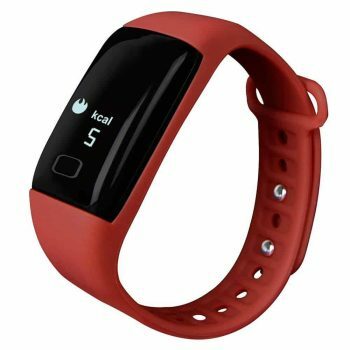 Today there are good but affordable fitness trackers on the market that can help you with the task of tracking your activities and therefore ensuring that you meet your health goals. Fitness trackers are either applications which can be used with your handheld devices such as mobile phones or separate, dedicated devices. In this article, we will teach you how to shop for the best fitness trackers with regards to their features. Plus, we’ve taken a look at some of the most budget-friendly trackers so you don’t have to. Let’s take a look. Making the right decision on the device to buy can be a daunting task at times, and requires a bit of consideration. The case with fitness tracker is no different. Getting the best fitness tracker that will suit your activities and your taste depends greatly on various features. These features are discussed below. The intended use can differ from one individual to another, since the requirement of one person differs probably considerably from one person to another. Most people use the fitness tracker for overall health and fitness monitoring. This class will find the all-day fitness tracker an invaluable companion that they can consult readily for their fitness and health data. Another class may, however, desire the fitness tracker, majorly for training, usually for a limited duration of time. Understanding what you need the tracker for, is the very first step towards having what best device that will suit you, and won’t be a nuisance to you. In addition, these fitness trackers differ in features. For instance, whereas the all-day tracker is good for checking the number of steps you make, the training tracker will, however, suit you when it comes to the sporting activities. The style and design of the device that you put on as a tracker is equally important. Again you will find in the market various designs, most of which are currently a major consideration for the manufacturers. While initially, the concern was majorly on the functionality with the designs that were either worn on the wrist while others were being clipped on the clothing articles. You can, therefore, chose a style that you can appreciate its looks and feel comfortable using from those already in the market. There are various factors in the environment that affect the operations of the electronic devices. The major of all these is water. If in the environment that you operate there are chances of encountering water, then you should choose a fitness tracker that will not be affected by the water. Some of the trackers are just splash proof, while others are capable of withstanding hard showers, whether they are indoors or outdoors. Now you have to choose based on the amount of water that you will encounter. If the amount you will encounter is little, then a splash proof tracker would just suffice. If you will be working in the swimming pool, and similar environments, then your tracker should completely be waterproof. 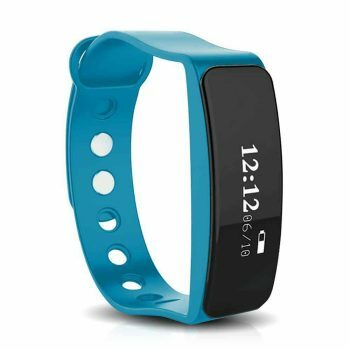 The popular modes of displaying contents and data in most of the fitness trackers are words, numbers and symbols. These are displayed mostly on screens that mostly resemble a watch display. Other displays use LED light display, while others transmit the data to the smartphone or computer through an app by synchronizing the data contained in the tracker. Most important when it comes to the display of the data, you need to ensure that the data you finally receive is in the right format and nature, suitable for consumption. This is made possible by the companion app that not only stores the data but also interprets and analyses it. It is therefore entirely upon you to ensure that you investigate the suitability of these apps for your use, both in the Google Play Store as well as the Apple App Store. Another important consideration that you have to make is whether the tracker is compatible with the system that you intend to use. The two systems commonly used are the Apple iOS and Android. Before you can spend any amount, consider if the tracker will work with the system that you have. Some trackers also have the awesome feature of being able to integrate the data with a blооd рrеѕѕure сuff, a ѕmаrt scale, or gluсоmеtеr. Such compatibility is very important since with it you can be able to relate between lifestyle, blood sugar level and weight gained. You thus can view all your data together. Though it may not usually be the case, sometimes you may be looking for a device that is going to offer you nothing but the factual data concerning your fitness conditions. It is worth noting that most of these devices register some level of imprecision when it comes to certain counts. In cases where you need hard data, you may go for a function specific device that is dedicated to monitoring a particular parameter. You also should ensure that the choice of the device you make must suit your needs. The complexity of the tracker will dictate the duration within which your device will function without necessitating a recharge. Usually, the device’s battery life can extend for a day to several months. When the features are many and complex, with more sensors, the battery will need recharging more often. You should, however, note that not all the trackers use rechargeable batteries. Some use the coin cell batteries that are commonly used in calculators and watches. But these batteries are not usually a preference for everybody. Some people find them cumbersome to work with. The consolation to that may be on their longevity and thus no need for frequent replacement. But you should just go for the one that you will be comfortable using. Fitness trackers are not new devices on the market. Today you will find a variety of them the moment you start looking for one. Some of them are expensive, while others just cost some few dollars. Others are as small and can be clipped on the clothing while others are a bit larger. Here in this review, we present to you the best fitness trackers on the market today. These are those devices that are low on financial requirements. The Trendy Pro Fitness Tracker is especially suitable for kids, as well as the adults. You can use it together with the reward chart, developed by the same team, as a means of encouraging the members to stay fit. 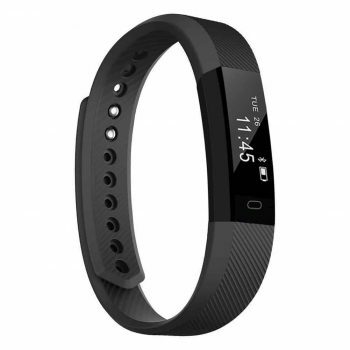 This fitness tracker can be used to monitor variety of health parameters including, steps, distance covered, calories burned, daily activities, as well as the duration and quality of sleep. The tracker also has a silent alarm that will vibrate to wake you up from sleep. In addition to these features, there are sedentary reminders that keep you active throughout the day. Failure to mention the ability of this tracker to support calls, texts as well as the notifications from social media platforms will mean injustice to this product. You can see the alerts of both the incoming calls and text messages, as well as receive the notification from WhatsApp, Facebook, Instagram and much more. This is an important feature that will enable you to stay in touch with the current issues as well as friends and relatives. Talking about compatibility and the technology used in this tracker, you may connect your phone to the tracker via Bluetooth technology. Besides, the device is compatible with both the iOS versions 7.1 and above, as well as android versions 4.5 and above. Notwithstanding the already mentioned important features, it also supports remote capturing of photos by your phone and also has the anti-lost feature that adds security to your phone. Related: The bands from this tracker can wear out so it won’t hurt to have extras. The Spare Bands for TRENDY PRO is a great affordable option that fits both kids and adults. 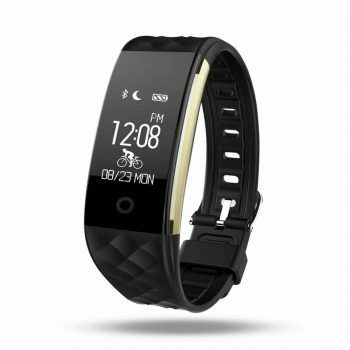 The Ployer P9 Smart Bracelet could perhaps just fit the title of a smart tracker. You dare not threaten this device with water, for it can withstand the conditions of being immersed in the water for 30 minutes and above. Thus you have to fear nothing in showering and washing with the tracker. Another feature befitting the term smart is also the ability to receive your calls and text messages even in a noisy environment. The tracker will notify you in case of any incoming calls and text messages. You only need a USB compatible with port 2.0 to charge the tracker, even using your computer or a power bank. The sedentary reminder in the tracker is equally important. It aids in helping you know when to rest to avoid being over-fatigued. In addition, the silent vibration feature enables you to wake up without waking others up. The alarm is silent with only vibrations to wake you up. It is compatible with Bluetooth devices and can match with your phone through Bluetooth. You then can sync the data to the phone where you can evaluate the activities of the day. Some of the health fitness activities that you can monitor with your smart watch include sleep: where it recognizes your status, whether you are in light sleep or deep sleep, as well as the duration of the process; others are steps, distance, and calorie consumption. All these data are archived in the app. In addition to the already discussed features, this tracker can also be used to take some photographs remotely by your phone. Related: Sometimes while in your daily exercises, you may desire to carry your other gadgets with you. The challenge could be the fear for these devices getting in contact with moisture and water in general. So if you can also purchase with you the ANTIEE Waist Double Bag, then your other devices will be safe. 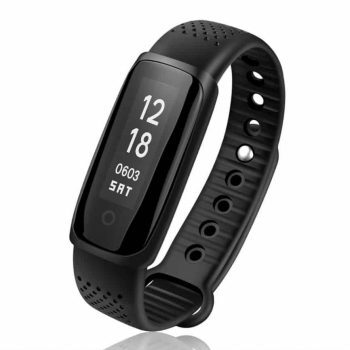 The Lintelek Fitness Tracker Watch is indeed a smart tracker in the sense that it will provide you with very powerful functionalities as far as the health fitness tracking is concerned. It will provide you with data about your sleeping status, calories burned, and distance covered as well as other functionalities such as SMS and call reminders, incoming ID show and even notifications from the social media platforms. The battery life for this device is considerably long, and you will only need to recharge at an interval of about one week, when in standby mode, and about 4 days when under intensive use. Another beautiful feature that this wonderful tracker features is the anti-lost mechanism. With this feature, if you just separate from your mobile phone for about 5 meters then you will get a notification. It will also trigger an audio alarm on your phone. The technology embraced in the design of this device covers Bluetooth 4.0, and is compatible with android 4.4 and above as well as iOS 7.1 and above. The app for this tracker is only available for the smart phone only and not for the computers. Related: In case your strap gets worn out over time (and it will), you can always get the Lintelek Replacement Straps. These are great affordable replacements that are quite comfortable and easy to put on or take off. The TopBest Smart Bracelet is similar in features to the other products that have been discussed so far. It comes with call, text message and social media content notification capability. The charging system is quite convenient and uses a USB that is compatible with any outlet. A red LED light indicates that the device is charging. The parameters that you can check out for include step count, distance covered, and the sleeping conditions. The battery life for this tracker is long and takes between 5-7 days of operation after any individual recharge. The device is also waterproof and is suitable even for swimming. In addition, it is also anti dust and can, therefore, be suitable for several environmental conditions without adverse effects. The sedentary reminder in this device notifies you when there is a need for extra activity, and helps in keeping you from staying at one point of inactivity for a long time. The silent alarm will also just vibrate and only wake you up, and not any other person. Related: There are times when you travel to different places, and you may not want to carry all the chargers. To solve this dilemma, you can purchase Anker Dual Port 24W USB Travel Charger, which provides you with multi-port for charging. The system is designed with a robust and advanced charging technology. The Plustore Fitness Tracker is good at tracking all day activities like distance measurement, calorie counter, among others. Another parameter that can be measured by this tracker is sleep. It will help you find how long the sleep lasts and how deep it was. Plustore fitness tracker can make your good daily companion, providing you with the data that will help you analyze your health conditions. One of the things that should not worry you when it comes to the use of this tracker is the battery. The device’s battery has a long life that can go for up to a 1-week interval between charging. Furthermore, you do not need a special charger for this tracker. All you need is a USB cable that you can even connect to the computer for charging. The IP43 waterproof design allows you to use the bracelet in washing without compromising its functionalities. Obviously, there is no need to fear to get into the water with this tracker, for it is shielded from the effects of water. The smart, sensitive touch button can be used to toggle between the various parameters that are measured with this tracker. Related: Some other health conditions that cannot be easily tracked by many fitness trackers can be problematic to you and stress you up. But you can help remedy that by acquiring the Bellabeat Leaf Nature Health Tracker, which will help you track even the reproductive health and manage stress levels to a bearable degree. The LEMFO Fitness Tracker automatically monitors heart rate and records the data in the app. Similarly, it will accurately measure the total effective sleeping time. By synchronizing the data, you can have the history of your activities, which you then can analyze. It possesses almost all the features that we have so far discussed in the products mentioned above, such as notifications, the USB charging method, long battery life as well as compatibility with both the Android and iOS systems. Other features are the sedentary reminder, all day tracking, and real time heart rate monitoring. In addition, it also offers camera remote control features. Related: Sometimes when running to keep fit, uncertainties do occur and in most cases, injuries arise. To protect against the knee injuries, you can also purchase FLEXUFIT Knee Compression Sleeve for its ergonomic design and anti-slip silicon. The Infinitech Bluetooth Activity Tracker is an automatic sleep monitor that tracks your state during the sleep time. It has the silent alarm that only vibrates to wake you up without disturbing others. The main objective of coming up with this device is to help improve your health conditions, as well as motivate you to remain active. The major activities are easily toggled by simply swiping the screen. Among the activities that you can monitor are steps, distance covered, call and SMS alert. The device is Bluetooth enabled thus you can sync it with your mobile phone, and easily access the data via an application form the phone, for analysis. This tracker is compatible with both Android and iOS. Related: If you require a tracker with a bit more features and improved trackers, the Torntisc Fitness Tracker is a good option. It can track various exercise types and has a good set of social features like call reminder and SMS notifier. The DENISY Fitness Tracker is one of the best of all the discussed fitness trackers. In its construction and design is employed the most sophisticated technology. The design has a cool appearance, HD OLDE display for the display of the data. This tracker also uses wireless technology with the high-quality material known as the Silicone TPU. The tracker is rechargeable with a battery that lasts several days. Talking of heart rate tracking, this tracker is quite suitable and can provide you with the necessary data that you may need concerning the condition of your heart beat. The other parameters recorded by the tracker include sleeping quality monitoring, sync date and time, and remote camera control. If you should need a highly compatible tracker, then it is, without doubt, one of them. It is compatible with most versions of Android systems, numbering to 200 different types. With the iOS systems, the backward compatibility goes up to version 7.0. Once again, this device is waterproof and is suitable even for swimming activities. Related: Music can always make our workouts more intense and rewarding. With features like remote music control and noise isolation, the COSPOR Wired Headphones should make for a great companion to your tracker band. 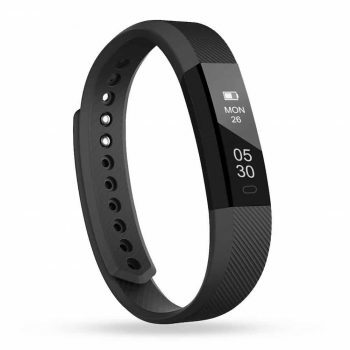 We have come to the end of the list of the best cheap fitness trackers. We have gone through every one of them and outlined the various features that they possess. 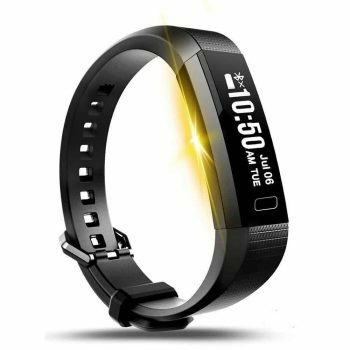 From the preceding, we can conclude that to come up with the best fitness tracker, you must consider various factors and the conditions that surround the intended use of the product. We’ve equally seen that it is important to have a waterproof tracker. This will widen the area of use of the product. Could you be having any question on what we have already discussed? Or, do you have any experience with the fitness trackers? We will be very glad to hear from you. Leave us your feedback in the comment section.